Michael Connor | Mon Feb 9th, 2015 12:21 p.m.
Screenshot of VVORK post from April 2006, as archived by Rhizome. Today, Rhizome unveils a new archive of the contemporary art blog VVORK (2006-2012), in which we demonstrate a novel solution to the problem of conserving websites with embedded videos. VVORK makes a useful test case for our digital conservation efforts because it presents one relatively narrow but difficult set of problems to solve. 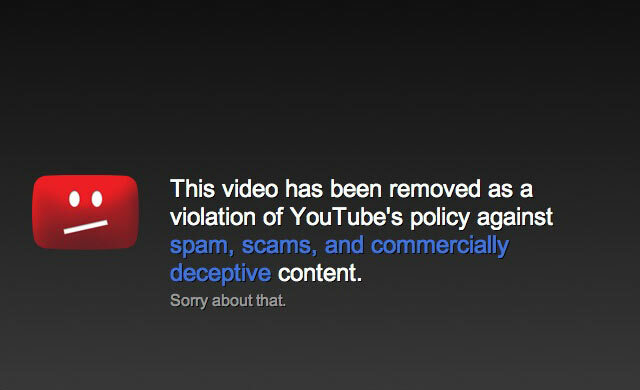 That is, when videos are embedded in a website, they are generally hosted on a third-party platform (on YouTube, for example); this means they may be deleted or taken down, sometimes for "inappropriate" content. But saving these videos into an archive creates problems for most scraping tools, especially when a video is used in many different contexts, as when the same video appears on multiple tag pages. The way these platforms select and serve the video files makes it difficult to have all embeds of the same video point to a single archival copy. To address these issues, Rhizome's Digital Conservator Dragan Espenschied used Colloq, a tool for creating contextual archives that was developed by Rhizome in partnership with Ilya Kreymer beginning in 2014. (The service builds on Kremer's pywb tools; you can read up on the technical details of of capturing the web video here.) Colloq offers a robust solution for this long-standing issue; with VVORK as a test case, we have created a stable archive of the site including nearly all embedded video. From a cultural perspective, VVORK is an important part of Rhizome's archive because of its role in the changing relationship between internet and gallery over the past decade. Looking at the site today, it can be difficult to understand how a very simple WordPress blog featuring images and videos of contemporary art, with minimal captions, could have become so influential and controversial. It now seems commonplace, like a million Tumblr feeds; it was even recently described by Frieze as "a Tumblr." Blogging in 2006 was still a very text-heavy affair. In April 2007, one year into VVORK and just after Tumblr's launch, artist Sally McKay commented on its singular form, arguing that "VVORK is popular because they show lots and lots of pictures of art from around the world without a bunch of commentary. I love that! It's kind of weird how rare it is." This emphasis on text was encoded into blogging platforms themselves. The name of VVORK's chosen tool, "WordPress," as well as its user interface (in which users were invited to "Write Posts" in large typeface, and to "Add Media" in the fine print) betray the emphasis placed on writing over imagery. Thus, VVORK's format should be understood as a specific, intentional use of the blog, not as a default format of the Tumblr age. 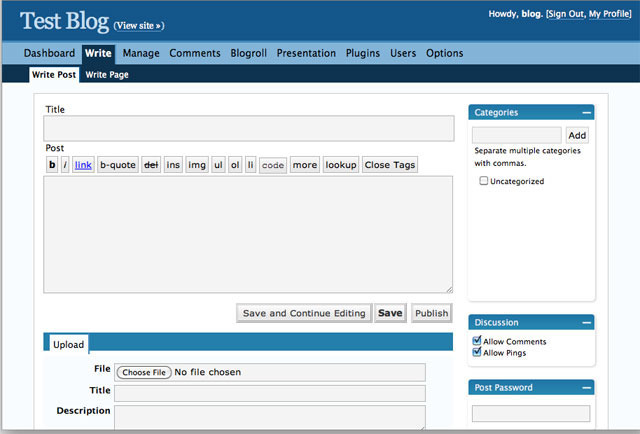 Screenshot of user interface for Wordpress 2.1, via Mashable. Even if the format was lovable, VVORK often seemed to be a target for criticism; there was a great deal of hand-wringing about it at professional symposia and the like. By looking back at some of these criticisms, we can begin to shed light on some aspects of VVORK's influence. One of the points raised about VVORK was that it seemed to imply that all art looks the same. Very often, there would be several quite similar works posted in a row. For a sense of this, browse the page compiling all posts labeled with the tag "plant," for example. As McKay put it, a lot of the work on VVORK could be described as "elegant sculptural installations crafted well from non-precious materials with interesting but tidy content and an unquestioning relationship to art institutions." This description sounds very similar to some of the stylistic descriptions offered up for postinternet art today... plus ça change. Some fretted that this emphasis on similarity undercut the artists' individuality. Artist and Rhizome friend Guthrie Lonergan took this view; he argued that "VVORK makes 'clever' very unappealing, like some disease that art catches when it gets on the Internet." The similarities and patterns made it seem as if artistic production was "algorithmic to the extreme." Writers seem to comfortably admit that they read and have read books, while many artists seem to cultivate the image of the isolated genius, detached from any outside influence…But the motivations behind the series were quite diverse. Seeing the sequences was useful to understand tendencies and to view the potential of different interpretations of an idea. VVORK depicted artistic production as a networked, collaborative process subject to certain patterns, and it saw potential in iteration. [art announcement email list and online journal] e-flux and VVORK function as conventional news resources on art…the contemporary art world is still stuck in a mentality of regarding (and using) [the internet] merely as a medium *on* art instead of one where art can happen. VVORK isn't "merely" an online publication; it's impure, nonspecific, incorrect net art at its best. When VVORK announced, in late 2012, that they were shutting down, Rhizome's then-conservator Ben Fino-Radin scraped the site in a state of semi-panic via a wonky wifi connection in his hotel room (or so I seem to recall). He was worried that the server would go dark, and that an important part of net and postinternet art history would be lost to public view, so he acted quickly, and rightly so. This archived version was mostly complete, but it had a problem: there were 135 videos embedded in the site. These were hosted on external servers and subject to forces beyond the control of VVORK or Rhizome, and a number of them had already disappeared. In its six years of activity, VVORK used all kinds of different video embedding techniques provided during that time by the platforms YouTube, Vimeo, SoundCloud, Dailymotion, Ustream, Google Video, and the Internet Archive. Most of the embedded videos were set up to use the Flash plugin for replay, which raises problems with archiving and even more problems with access on current systems. The technique used was to swap out the the flash embeds with the updated HTML5 embeds that the video platforms use currently, and store the HTML5 video versions in the archive. When there was no HTML5 video available, the flv flash video was captured. The VVORK archive is 392.5 GB in size in the warc file format. Image from oldest existing VVORK post, April 1, 2006, captioned "Exhibition documentation by Dearraindrop" and categorized as "Virginia Beach." Rhizome conducted the following interview with VVORK while archiving the website, with research support by Anton Haugen. Rhizome: The oldest existing post on vvork.com was published in April 2006. 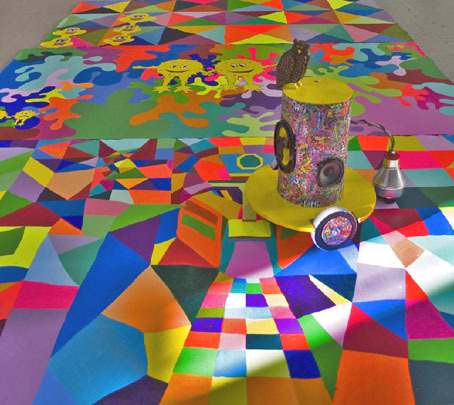 It's an image of a colorfully painted floor with geometric patterns and comics-style characters. It was given the caption "Exhibition documentation by Dearraindrop" and categorized under "Virginia Beach." A factual question: is this exactly how that post appeared when VVORK started, or might it have been altered later? And a less factual one: do you remember posting that image? Why did you want to start there, and what was your feeling when you posted it? VVORK: It was the first post and there has not been any alteration. We do remember posting this one; it felt liberating, to post an image without having to negotiate or ask for permission from anyone. We took the post down after a few hours because it was the end of March, and we wanted a more appropriate date to begin, so we reposted it on the first of April. What was the general situation on the web in 2006 that made you feel that VVORK would be a compelling format online (serially posted images with minimal description)? Why did you decide to work with an online format rather than a paper-based magazine? Before the blog, we were producing a magazine that existed in other magazines. We did not have print or distribution costs, but were still dependent on the good will and understanding of other magazines that allowed us to exist within their pages. When we first noticed blogs or online publications, it seemed too good to be true that you can reach people from around the world, with minimal costs and flexible publishing rhythms. When did you realize that a lot of people were paying attention to the site? After the first day of posting, we could see that hundreds had been on the site (after a spam mail out), which surprised us. This developed to a thousand per day within a month, and to about twenty thousand per day after two years. After the first month or so we noticed an increase in mails by artists sending us their works. After a year or so, it became more common to hear about its effects away from the keyboard, mostly from artists who had received invitations to shows after being posted. This was part of what motivated us to keep at it. It functioned as a platform for others and ourselves. Our first invitations to take part in exhibitions happened through VVORK. Let's talk a bit about how the site was organized. It was primarily experienced chronologically, which foreshadowed the web we have today in which the "feed" is the dominant paradigm, and the search and the surf are dying. At times there are certain thematic developments, but often the juxtapositions of certain sets of images can be jarring. How did you think about pacing and structuring the content? Were you specifically interested in chronology as a formal device? The chronological structure was the predetermined standard of WordPress, so it was not a conscious thematic interest, but rather a pragmatic convenience. We saw a necessity in the daily activity for it to work, so we tried posting 3 to 4 works a day, including Sundays and holidays. This rhythm was essential in having a regular audience. Also on this topic, can you talk about the use of tags on the site? I remember using tags to navigate the site, but now I can only seem to find them by using reverse Google Image search. For example, the aforementioned piece was tagged "colors" and "colorful" and "colours." The tags still work if you click on the Index. Or if you search them via the search function. Our tagging system was similar to a stock image tag system. We were leaning towards objective descriptive terms. It's a bit messy, but I can imagine that its quite useful. When Tumblr started, which basically gave users a pre-made VVORK of their own, did that change your thinking about the site in any way? Not right away, but Tumblr’s growing popularity slowly did. Over time, the feeling of urgency to continue declined. 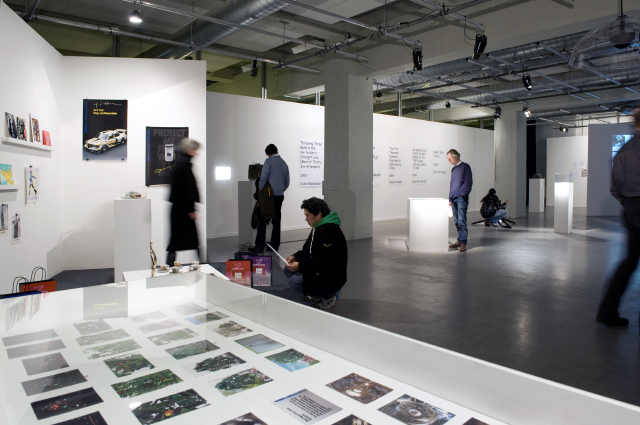 "The Real Thing," exhibition curated by VVORK for MU Eindhoven, 2009. For me, one of the central ideas that VVORK embodied was that documentation is not secondary to in-person viewing of art. It gave people a meaningful online experience of supposedly offline work. Was part of your intent with VVORK to empower documentation as a viable experience of art? If so, why did you feel this was important to do? The mediated experience is often our preferred experience, not just with art but also with books or movies. In 2009 we dedicated an exhibition to this subject, titled "The Real Thing" after a short story by Henry James in which the protagonist prefers the represented over the real. At that time, the exhibition went rather unnoticed, it did not seem to be a subject of interest as it is now. We were interested in a leveling of value and in moving away from the binary distinction. It also served the purpose of making works experienceable from cities that are not New York, Berlin, London, or Paris. Writers seem to comfortably admit that they read books, while many artists seem to cultivate the image of the isolated genius, detached from any outside influence. There are, of course, different ways to respond to the awareness of the works of others. It is not a necessity that it leads to emulation or innovation. It might get harder to make another neon after having seen such a vast amount of them. But the motivations behind the series were quite diverse. Seeing the sequences was useful to understand tendencies and to view the potential of different interpretations of an idea. Occasionally, it was a means of highlighting anachronistic market trends, as when we posted a series of abstract expressionist paintings, from the '40s to contemporary examples and from noted artists as well as from lesser- known amateurs. I would be surprised if you could spot the difference or categorize them historically. In a way, VVORK’s function has now become the preservation of work that does not exist anywhere else online. How do you think the site’s function has changed as time has passed, and now as part of the Rhizome archive? We are very happy to be included in Rhizomes archive, thank you very much for the effort. Indeed, it does feel like an archive now, and portrait of a few years. Maybe we will reactivate it some day. Throughout this post, original authors' capitalization of Internet has been retained. VVORK was captured using Colloq, Rhizome's protoype social media archiving tool. Colloq is funded by the Knight Foundation and is based on the web archiving toolchain pywb, developed by Ilya Kreymer.